Secure and Strong Asymmetric (Public/Private) Encryption. Supports Activation Keys and Unlock Serial No. Time Limit (exact date and number of days). Embed Additional (Custom) License Data. Simple API to Integrate with Your Software. 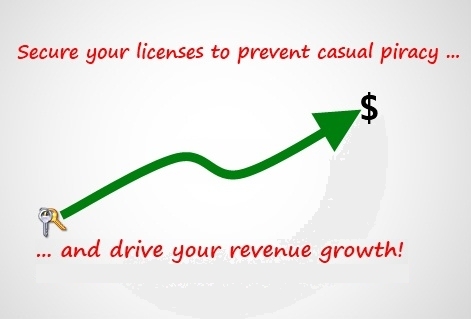 A Web Interface to Manage Licenses. 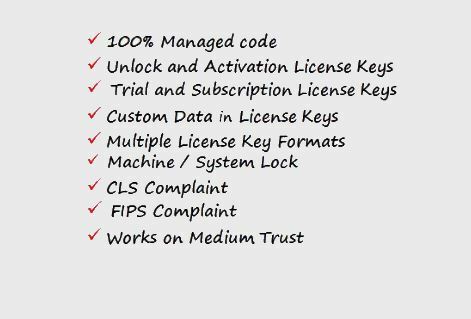 Secure License Manager comes with components to generate, validate and activate (online & offline) license keys. 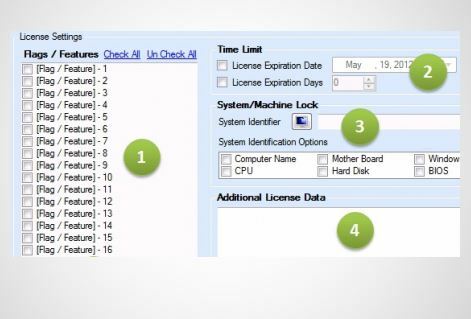 Secure License Manager comes with both a desktop and web based interface that allows you to manage your license keys. It also comes with a license web service that you can use to implement online activated license keys and can be hosted even on medium trust environments that is common for most shared hosting environments. Create unlock license keys that can be unlocked without the need to contact a server and for additional security, you can also create activation license keys which can only be verified and activated by contacting an activation license service. Generate license keys that are tied to a specific system/machine to enforce that licenses can work on a particular system/machine the license was generated for. Generate compact license keys by choosing Public/Private key sizes that range from 384 to 2048 bits and using various license key formats. // license key to register an evaluation/trial license. // evaluation/trial license key using a setup program. // Save the license for future use if it is valid. // or terminate the application. // Request for a valid license. // then terminate the application. // or show some other failure message. Dim validationKey As String = "BgIAAACkAABSU....."
' license key to register an evaluation/trial license.
' evaluation/trial license key using a setup program.
' Save the license for future use if it is valid.
' or terminate the application.
' Request for a valid license.
' or show some other failure message.